How Safe is Your Kid's P.E. Class? Growing up, you might have thought P.E. class was nothing more than a period to get out of the classroom and run around cutting up with your friends. But the fact is that physical education is more important than ever. With childhood obesity rates more than doubling in the past 30 years, it’s critical that schools put an emphasis on creating a safe environment for kids to get out from behind their desks and get a little exercise. Unfortunately, some schools aren’t doing such a great job at this. In fact, several California school districts are being sued for allegedly not giving kids enough P.E. time. And even in the minority of schools that are giving their kids enough physical education, there are sometimes serious safety issues that need to be addressed. As a parent, it’s important that you do your part to make sure your child is as safe as possible during P.E. class, both by providing him or her with the right equipment and by being vigilant to make certain the school is doing its part to provide a safe environment. Check out the school’s gym. Unfortunately, slashed budgets may mean some schools aren’t putting as much time and money into gym maintenance as they should. Proper gym maintenance is essential to providing a safe environment for P.E. class. 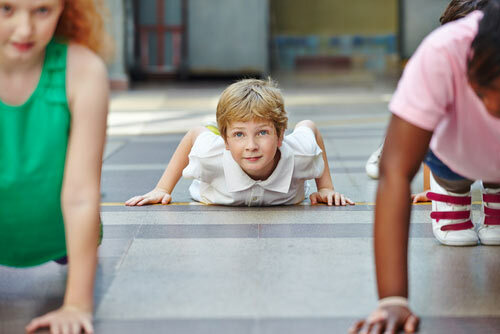 At the beginning of the school year, make the time to do a walkthrough of the school’s gym. Check the condition of the flooring to make sure it’s clean and in good repair. Make sure the walls have proper safety padding, and pay attention to the equipment around the gym to verify it’s in good condition. If you notice anything that doesn’t seem safe, bring it up to the proper authority figures at the school so it can be addressed. Outfit your kid with the right gear. Kids need the right shoes to participate safely in P.E. class. Tennis shoes that fit properly in the ankle and foot will give your child’s feet the support they need to run, jump and participate in physical activities as safely as possible. Note: skateboard shoes, Crocs, flip-flops, boots, sandals, etc. are not appropriate footwear for P.E. class. Do your part to get your kid the right shoes for P.E. and to make sure he or she brings them to school daily for class. In addition to footwear, make sure your child has comfortable clothing for physical activity, depending upon the weather (e.g. shorts and T-shirts for warm months, jogging suits for cold months). Check regularly to make certain your child is getting enough P.E. As schools continue to feel the pressure of raising standardized test scores, they often cut time for P.E. in order to make time for other subjects. Many states have regulations that require schools to provide kids with a certain amount of P.E. time. Even in those states with such regulations, the fact is that healthy, active students perform better in school overall. It’s important to be an advocate for your child’s physical education, holding the school accountable if necessary to provide the recommended amount of P.E. time and getting involved in school communities and fundraising groups to support P.E. in your kid’s school. Get your kids active at home. Which child do you think will be safer in P.E. class, the one who gets plenty of physical activity on a daily basis at home or the one who lives a completely sedentary lifestyle away from school? If you emphasize the importance of regular physical activity with your child at home, he or she will be better equipped to participate in P.E. at school in a safe manner. It’s recommended that children and teens get at least one hour of physical activity daily, and you can do your part by ensuring this happens at home. As another school year begins, make an effort to ensure your child is getting safe, quality physical education this year. Shana Brenner is the Marketing Director of CoverSports, an American manufacturer of gym floor covers and athletic equipment with roots tracing back to 1874.